With the artisanal water craze on a rise, we meet Water Library: a glassy, round restaurant that juts out from Chamchuri Square. But don't let the wall of Fine, Wattwiller, and Voss scare you off—it's not just about liquids. 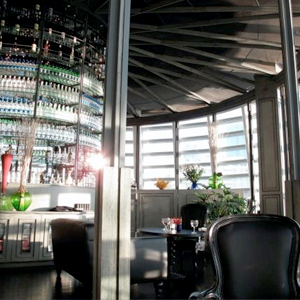 Water Library is a fine dining restaurant specializing in European cuisine. Under the helm of Chef Haikal Johari (formerly of Ember) we get a mix of casual dishes made from high quality ingredients like Wagyu Beef Burger, Old Fashioned Fish & Chips, and Tajima Wagyu Sirloin Steak with Anchovy Butter and Mashed Potatoes. Over 100 bottles of wine are available for pairing, although considering the situation, a bottle of H2O from Scandinavia will also suffice. Go to MRT Sam Yan Station, and take exit 2. Chamchuri Square will be right behind you. Water Library is on the 2nd Floor.